There was a time when I can remember being absolutely horrified of Brussels sprouts. When I was little my mother hardly made them, and whenever we had them at friends’ houses they were always the over-cooked, mushy, previously frozen kind. In high school I participated in a journalism program in Berkeley. A friend of mine had made dinner reservations at Chez Panisse, and after that glorious meal, I was a devout Brussels fan. It turns out most people are afraid of foods because of their bad experiences with them during childhood. It’s different from when you’re an adult and have a bad dish here and there; more than likely, you’ll be more likely to try that thing again. After getting a taste of Alice Waters’ Brussels sprouts with bacon and onions,I knew this was an vegetable that I would have to get acquainted with. A couple of years ago, I was gifted with a copy of Alice Waters’ “The Art of Simple Food.” To this day, it is one of my most favorite resources when cooking at home, and it’s one of the only cookbooks that I have read cover to cover. 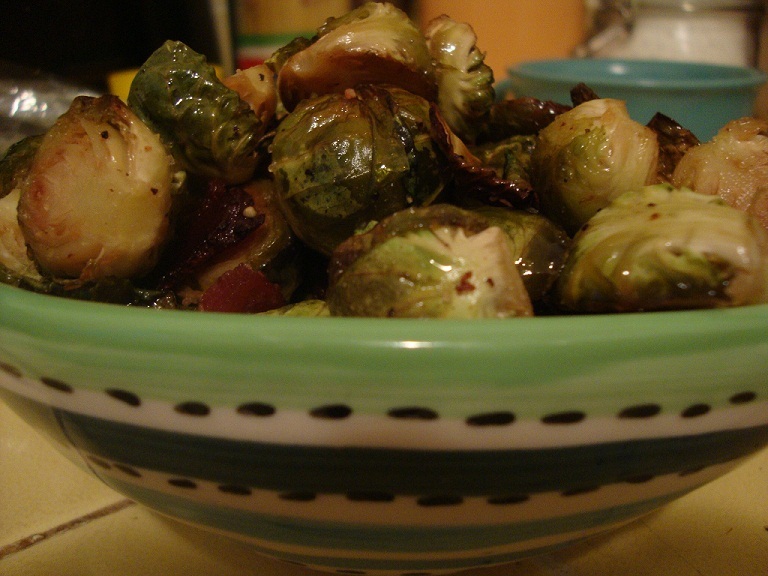 I have taken her recipe for Sautéed Brussels Sprouts with Bacon and Onions and modified it for this delicious autumnal side dish.